Howard Wooldridge plans to ride across the US - again! Howard Wooldridge, F.R.G.S., is riding Misty across the United States - again! Howard Wooldridge is riding from Los Angeles to New York, having already traveled from the Atlantic to the Pacific. Misty doesn't know it yet, but Howard is taking her on another trip across the whole of the United States. She has already carried him from the Atlantic to the Pacific. Now Howard has left Los Angeles and is riding to New York! This will be a truly historic journey, as nobody that we know of has ever ridden across the United States in both directions! Their route will take them some 3,700 miles. The first 1,800 miles will be the toughest as the terrain will offer very little grass for Misty. Howard and Misty have arrived in Colorado Springs just in time for Howard to celebrate his birthday! All is going well, and he hopes to be in New York in October. "I was able to borrow a 6 y/o, 16-0 hand Andalusian gelding and he became my primary mount since leaving Denver. Misty hurt herself on a stumble and is out of action until about Chicago. It is physically and mentally tough to plug into 30 miles (50 KM) 6 days a week but I am handling it. I am pleased to be over half done without major incident or problem. Iowa is having the best shoulders I have ridden in 5,000 miles (8,000 KM). The response across America to the message to end the drug war is much stronger (positively) than even 2 years ago." 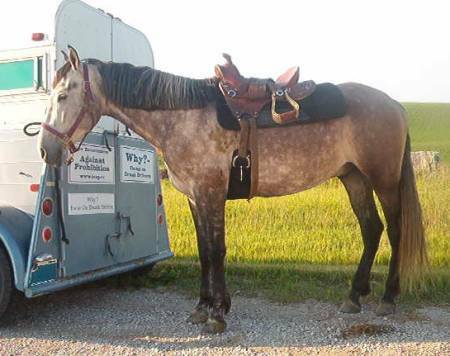 Howard has reached Madison, Wisconsin, and has sent us a photograph of his second horse, named Sam Bass. Please click on photograph to enlarge. I am enjoying the days off in a real stall on this ranch near Lansing, MI. Not being ridden or used since I carried Howard over the Missouri River at Omaha has been hard on my head. I want Howard to ride me but I know my tendonitis prevents it. It is frustrating!! Sam has been a real trooper to do the miles for both of us. He is not happy to be on the road but I have assured him there is an end to the North American continent. Howard had my shoes removed yesterday + my hooves were trimmed. He said I will be walked a few miles every day (in boots) and when we enter Ohio (wherever that is??!! ), he hopes to ride me a few miles a day. Has anyone called my mother to get this maniac off my back?? Are all the phones in America out of order??!! Has PETA gone out of business? I have resigned myself to this voyage across America and no longer fight Howard every step, every day. Talking to horses in barns across the Midwest, I am told by other equines to consider my experience as positive. Most of the horses I have met are bored to tears because they never go anywhere. Maybe, but I keep hoping New York City is just over the horizon. Howard praised me a lot as we spent 3 days going thru Chicago. 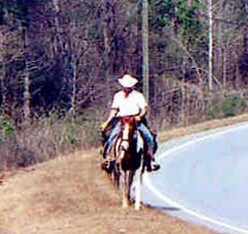 He said that since I had traveled over 1000 miles, I had become a Long Rider Horse. Does that mean I get extra feed? A discount on my next set of shoes? What? It has been a wonderful, relaxing 7 days at this log home of my dear friends near Lansing, MI. It has been such a struggle, mentally and physically, to arrive in one piece here. Media coverage has been great as Team Howard has kept the press releases going and calls are made. ABC TV put us on in Chicago and CBS TV put us on in Lansing. Combined media coverage has put the message out now to over 2,000,000 Americans. The response from people along the route continues to be overwhelmingly positive. Nobody wants to build more prisons. Many thanks for all your prayers and positive thoughts which have helped me keep my spirit positive and my body together. As we saddle up tomorrow for the final 900 miles, my heart is telling me that indeed this effort will bring the end of drug prohibition one week sooner than otherwise, saving some 700 people worldwide. Howard has just telephoned The Guild. His Long Ride is drawing a lot of attention in the media - he's been interviewed many times on television and radio, and reporters are writing stories in the newspapers about Howard's mission. As a result, "some seven or eight million people have now read or heard about my journey!" he told us. On Thursday afternoon, 15th September, Howard arrived in Syracuse, and will stop there over the weekend making appearances, giving interviews, and even riding in a parade. He expects to be back on the road on Monday. "I needed all my Longriding skills acquired over some 4,500 miles to tackle the noise, people, traffic and buildings during two days and the 15 odd miles of walking down Broadway on New York City's Manhattan Island. We had a great break, when Howard allowed me to gallop on horse trails in Central Park for 20 minutes. By the time we went through Times Square on day one, my nerves were shot. As usual, Howard read my thoughts and we exited the main street quickly and were extracted by the motor-home and trailer. The second day was not too bad. 10 minutes before we exited the concrete and skyscraper jungle, I smelled the salt water of the Atlantic Ocean and knew The Ride was about over. Howard mounted up in the park and led me to the water's edge. I saw the Statue of Liberty far out into the harbor. "We're done girl," Howard said and began crying in the saddle as he held my mane. A few minutes later the RV and trailer again extracted out of the depths of the concrete jungle. Howard tries to calm Misty in Central Park. Click to enlarge. It was an honor and privilege to carry Howard and his dreams across the North American continent. Though the miles were long and days mostly hot and often brutal, I will cherish the memories. I look forward to loping along the lakes near Washington DC on Saturday mornings. carrying my Long Rider into the morning fog. Howard says my book will be published in about three weeks. I am pretty excited about that. Howard said I am the first horse in this century to write a book!" "It was a long drive in the cramped trailer back to my home in Carbon, Iowa. I am now grazing in the pasture with my other 20 horse buddies, enjoying my old life. The last day of the ride was memorable. My pasture mates have been mightily entertained by my stories. On the last day all was well until we entered the Bronx in New York City. I was okay on the sidewalk, when I heard from above this giant clacking sound. Looking up I could see some huge gray thing coming at me and I decided to leave the area. Howard held onto my reins, preventing my escape. I swung wildly and I guess just missed crashing into the window of a bodega. The owner came out and shuttered it. Still going in circles, we swung into an auto repair place where I nearly sat down on a car. The noise and the monster thing were now gone and Howard was able to calm me down. He was leading me on the sidewalk, assuring me we were leaving the area, when the gray thing and noise started coming at me again. I raced down the sidewalk, trying to outrun it. Howard was holding onto the reins trying to slow me down without success. Howard bumped into a man who became angry. Luckily, it was a minor bump. Howard was able to direct my 1300 pounds down a side street and away from the gray monster. After a few minutes I calmed back down after my brush with the deadly monster. 30 minutes later Norma came with the motor-home and trailer. As Howard stripped my gear, he thanked me for my service over the last 4 months and 2,000 miles (3200 KM). I was never happy to be part of the expedition. I did not fight Howard the last 2 months but I never cooperated much either. I now pray daily that I never see his face again, for I know it could only mean one thing..... a Long Ride." Congratulations to Howard, Misty and Sam on safely completing this Long Ride.